The Illinois Senate Democrats featured the Ellman family’s campaign journey in their blog series. Read the story below. 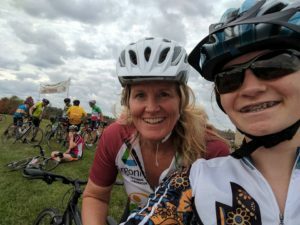 Laura and her daughter Lizzie bring their bikes on a camping trip every year. Laura Ellman swears her house is a “disaster” and that her kids, Lizzie, 17 and Barrett, 14, haven’t had a home-cooked meal in months. But it’s all for good reason. In her run for state Senate, Laura’s family has been her greatest support system. Laura reflected on her upbringing and how different it might have been if her mother had decided to run for office. Growing up in the Chicagoland area, her parents were Democrats and voted during election years, but were otherwise not civically engaged. Laura’s run for state senate has been a significant departure from her background. 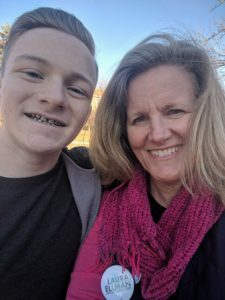 Despite the often hectic lifestyle of running for office, Laura is grateful that her children are able to see her making a difference in the community and hopes it will foster political activism in their own lives. Both of Laura’s children and her husband, Pete, have joined her to knock doors and talk to voters. A first time candidate, Laura’s family has embarked on the journey with her. From marching with her daughter at the Chicago Women’s March in January and knocking on doors with her children after work and school to her husband’s band performing at her campaign kickoff, the Ellman campaign is a family affair. Like many, Laura credits her decision to run for office to the 2016 election. In her Naperville community, Laura often wished that she saw more choices at the polls. But until Donald Trump’s election, she never thought it would be her own name on the ballot. As an advocate for women’s health, safe environmental policies and strong public schools, Laura envisions an Illinois that invests in communities and puts people over politics. Laura Ellman is a candidate for State Senate in the 21th district, which includes Naperville, Warrenville, West Chicago, and Wheaton. Follow Laura on Facebook for updates on her campaign!